I was there when she opened her eyes for the first time. Her thick eyelids, once sealed in the womb against amniotic fluid, split slowly: a deep crack revealing dark irises within. The first rays of light that ever struck her retina first bounced off my face. My face. 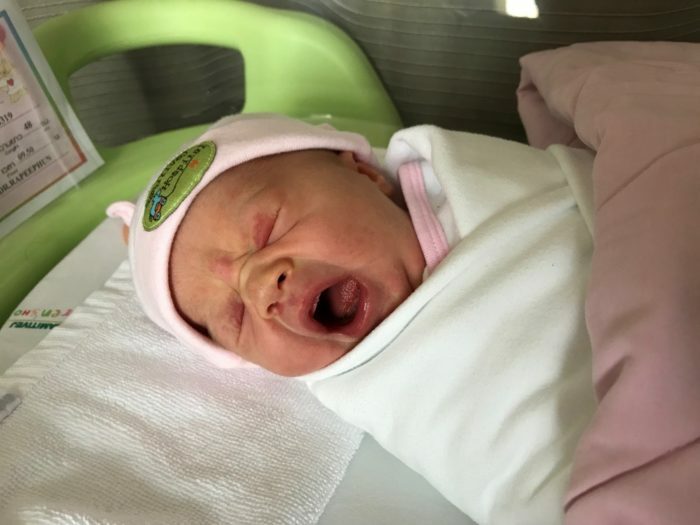 I was there because I was in the room for the emergency c-section the doctor ordered when her heartbeat dropped precipitously, disappeared from the monitor altogether, and returned, erratic, a signal of stress from unknown causes. We were there because hours before, Olivia had awoken with uncontrollable shivering and an alarming fever. A seizure? Probably not. Dengue? No idea. We rushed to the hospital and it all began. Midway through the surgery, the doctor called to me. I stood up from my station at Olivia’s head and looked down to see a new head sticking out of an abdominal split. It was Iris’s head, and it was covered in a combination of blood and a white substance that made it look extraterrestrial in origin. It is a strange looking alien head, said my head. She is my daughter, and she is beautiful, and she is alive!, said my heart, which in that moment expanded ten sizes to accommodate the torrent of feelings rushing though me. I went with Iris to the natal intensive care unit for monitoring while they put eight layers of stitches into Olivia. That was just two months ago. These feelings were strong enough that the prospect of an early delivery was almost paralyzing. I was counting on those extra two weeks. Every day started and ended with a silent scream into my pillow to anyone listening: Don’t you dare rob me of this time. I’m not ready. Other kids may be gross and annoying, but my daughter is the most perfect creature alive, and nothing she could do would be repellent. The practice of parenting has a learning curve, yes – but who doesn’t love learning new things? And, mercifully, the curve is shallow: an infant does not possess the capacity to max out my credit card, get arrested, or go on dates – much less roll over – and it seems quite possible to learn as you go. I don’t know anyone (yet) who has written me off for being a parent. But if they do, it’s their loss, not mine. Either we mutually adapt to new life situations or our friendship was never meant to last. The loss of freedom is real. “All joy and no fun” is one way I’ve heard parenting described, and I can see the truth in that. But adventure is still possible: so far we have fought back by putting 26,000 miles and four countries on her passport. The transformation from reluctant father-to-be to smitten dad was sudden, almost violent. Before the birth, my one consolation was having had observed a similar transition occur with my brother. He, too, had been terrified of becoming a father – and he, too, experienced a point-of-view inversion wherein the source of terror became a source of joy. It was comforting to me to know that such a metamorphosis was possible, and uncanny to experience it firsthand. How could such a change occur? According to a recent estimate, one hundred and eight billion humans have lived in the world since humanity’s dawn. One hundred and eight billion people have lived and grown and survived on this pale blue dot we call earth. One of these, Iris, was recently born – and she is the most special and beautiful person I’ve ever laid eyes on. Is Iris objectively special? Is she objectively beautiful? Setting aside the question of what “objectively” could even mean in this sense, the conclusion I’ve come to is that it simply doesn’t matter. The thing that’s special is in the relationship we have, the unspeakably complex dance of begetting and being born and coexisting as two interconnected beings. I have spent most of my life as a steadfastly rational person. Emotions are, by definition, irrational and difficult to understand, much less control. So I try to understand. And there are some logical explanations for parental love. Here’s one: as a concession to the benefits of walking upright and having large brains, human babies need to slip through the birth canal at an earlier stage of development than any other animal, before they possess any practical survival skills. The one thing they have going for them is a bewitching cuteness, which they use to manipulate adults into caring for them. From experience, this rings true. Here is how I imagine it: fetal Iris is out on a deep-sea fishing expedition, with me as her prey. She sets her line in my path and waits. First ultrasound: I know this means danger, and I will have no part in it. Second ultrasound: That looks a little tasty, but I know better. Third-trimester kicking on Olivia’s belly: Let me just nibble that a bit. And then she comes out and to hell with it— I swallow the hook with abandon and feel its thousand barbs lodge throughout my whole being. It should be painful, I know. But it makes me happier than I have ever been. Dunbar‘s number says we can only maintain stable social relationships with about 150 people at a time. We just can’t manage many more relationships than this. This says to me that we’re wired to value things on a small scale. In other words, it’s community that matters, not the general population. Following the convoluted analogy, I think I’m dangerously close to claiming that Iris has value because I love her, not because she’s objectively special. (What if she weren’t loved? Would she still have value?) I’m also coming close to circular reasoning: I love her because I value her, and I value her because I love her, and I have no control over that because of biological imperatives (or selfish genes, or Iris’s fishing expedition). And yet I don’t care, because this is the deep emotional truth that has embedded itself into my essence with its loving barbs. When I was about to graduate college, I met with a friend to discuss the transition. I mentioned the comfort that being with Olivia provided me in the face of upcoming uncertainties of life. In retrospect, this strikes me as a sign of embarrassing naïveté: I was twenty one years old at the time, and had only started dating Olivia a couple months prior. What did I know about life? For that matter, what do I now know about life? And yet, all these years later, Olivia and I have brought Iris into the world. Quantum entanglement begets quantum entanglement. Biology wins; or, maybe, love or physics wins. My fears used to be around attachment. Around being linked to another person in a way that would destroy my personal autonomy. Now I have bigger fears. We desperately want to build a world worth passing on. And for centuries it’s been assumed that human society is slowly, surely becoming more free, egalitarian, and just. Now I’m not so sure. Fear and tribalism seem alive and well. The funny thing about tribalism is that it’s based on a noble impulse that simply hasn’t gone far enough. Love of one’s kin and community is a good thing. The trouble is when we define our “tribe” and allow that boundary to mark the end of love and the beginning of fear. Love is a complicated thing. But if I’ve learned anything over the past couple months, it’s that love – even, or perhaps especially, unexpected love – shatters boundaries, real and perceived. Looking back at my rapid metamorphosis from reluctant individualist to smitten father, I’m struck at how it represents a radical expansion of my self. A small win for empathy in a world struggling to define the appropriate limits for such a concept. I know this parenting thing will be difficult. I know I’m in the “honeymoon phase” of being a father, and that the years ahead will be full of challenges and pain. Some of these challenges will be the direct result of stupid and selfish things I do. And some of this pain will be the direct result of stupid and selfish things Iris will do. And the questions may be even bigger than the challenges. Who is my “tribe” in a world with Iris? Do I hunker down, close in and call it “us against the world”? Or is there a way to let this newfound expansion of love extend into other relationships and interactions? What kind of world will we pass on to Iris and her peers? Oh, and lest we forget: how on earth does one raise a healthy, well-adjusted and empowered child? I would never claim that parenting is the best way to love. But for me, becoming a parent has forced a new kind of love upon me. Iris’s strongest weapon – literally her only survival mechanism – is fostering connection. And no matter how strongly I fought it, I’m hooked. On a road trip this week, my wife thought she saw something in passing. We didn’t think there were any trains in the region. I looked up from my iPad, but whatever it was passed out of sight before I could spot it. I could have easily bookmarked the spot in Rego or Google Maps, but I wanted to actually be reminded to search for the item on our return journey. Now, on the return journey, OmniFocus would alert when we approached the location in question. Everything was in place for the perfect train-looking-landmark heist… until we took a different route home. D’oh! Time to check Google Street View, I thought. A quick Google Maps search brought me to the spot. I did find a rather disturbing billboard in the vicinity, but no evidence of a train (or train imposter). So the end of the story is that, while it was a fun process, we still have no idea what the landmark actually is. Props to BBEdit for best-in-class search capability, which didn’t blink at the hundreds of compressed XML files in the OmniFocus database. And props to the driver, who found a faster way home. 2017-11-30 The app has been removed from the App Store. For posterity, here’s the CloudApp for iMobile entry on AppShopper. But hey, it’s cheap! Only $99/month! Fortunately, I know how to cancel iTunes subscriptions, but I’m sure a lot of the app’s users don’t. CloudApp for iMobile purports to sell a clone of all iCloud services, including Find my Friends. As far as I can tell, it does not actually provide these services. 1.1.7 App Store Reviews: Use the provided API to prompt users to review your app; this functionality allows customers to provide an App Store rating and review without the inconvenience of leaving your app, and we will disallow custom review prompts. But in the app itself, the “info” button goes to Apple’s own iCloud support site. 2.3 Accurate Metadata Customers should know what they’re getting when they download or buy your app, so make sure your app description, screenshots, and previews accurately reflect the app’s core experience and remember to keep them up-to-date with new versions. The app states “Subscriptions are from $4.99 USD Monthly or $9.99 USD Yearly with 3 days free trial.” In a world where everything is “fake news”, I don’t want to go so far as to call this a “lie”, but turning $9.99/year into $99/month might raise a few eyebrows. 2.3.1 Don’t include any hidden or undocumented features in your app; your app’s functionality should be clear to end-users and App Review. …I’m not sure what this means, but it sounds pretty accurate. 2.3.2 If your app includes in-app purchases, make sure your app description, screenshots, and previews clearly indicate whether any featured items, levels, subscriptions, etc. require additional purchases. You can’t actually do anything in the app without subscribing for the $99/month plan. This doesn’t seem to be stated anywhere. 2.3.7 Choose a unique app name, assign keywords that accurately describe your app, and don’t try to pack any of your metadata with trademarked terms, popular app names, or other irrelevant phrases just to game the system. App names… should not include prices, terms, or descriptions that are not the name of the app. App subtitles are a great way to provide additional context for your app; they must follow our standard metadata rules and should not include inappropriate content, reference other apps, or make unverifiable product claims. CloudApp is a preexisting service run by the good folks at cloudapp.com, not Tran Ngoc Lam, so that may be an issue. Also, while I’m guessing Apple doesn’t love the use of “iMobile” since it sounds confusingly similar to Apple’s own cloud services, the iMobile trademark is actually owned by TUNGTZU INDUSTRIAL CO., LTD. CORPORATION TAIWAN. Maybe they need to take it up with Apple? 3 Business …And while pricing is up to you, we won’t distribute apps and in-app purchase items that are clear rip-offs. We’ll reject expensive apps that try to cheat users with irrationally high prices. 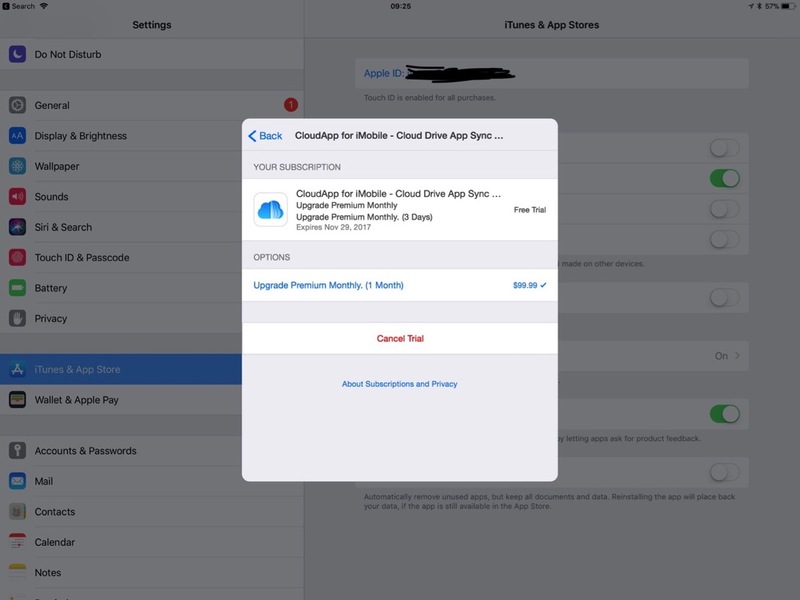 At $99/mo or $1188/year, if you subscribe to CloudApp for iMobile and buy an iPhone X – and use them both for two years – CloudApp will be more expensive by a factor of two. Apps must not force users to rate the app, review the app, download other apps, or other similar actions in order to access functionality, content, or use of the app. If this doesn’t constitute forcing users to rate the app, maybe the standard requires something more substantive, like threatening bodily harm to your relatives? 3.1.2(c) Subscription Information: Before asking a customer to subscribe, you should clearly describe what the user will get for the price. How many issues per month? How much cloud storage? What kind of access to your service? Also ensure you clearly communicate the requirements described in Schedule 2 of your agreement in Agreements, Tax, and Banking. Prior to upgrading, the app describes itself with features like “Increase memory for your Cloud”, “Find your iOS device, Apple Watch, or Mac”, and “Find your friends and family”. Although the app does none of these things, when prompted to subscribe to “UPGRADE PREMIUM MONTHLY” I realize that, deep in my heart, I do want to be premium. Is that enough? 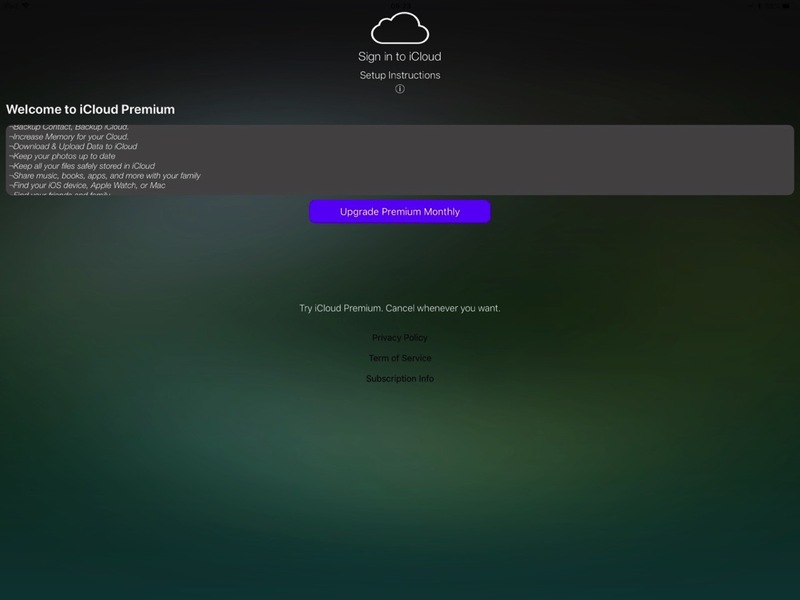 “Keep all your files safely stored in iCloud” just might be construed to be “monetizing built-in capabilities”. 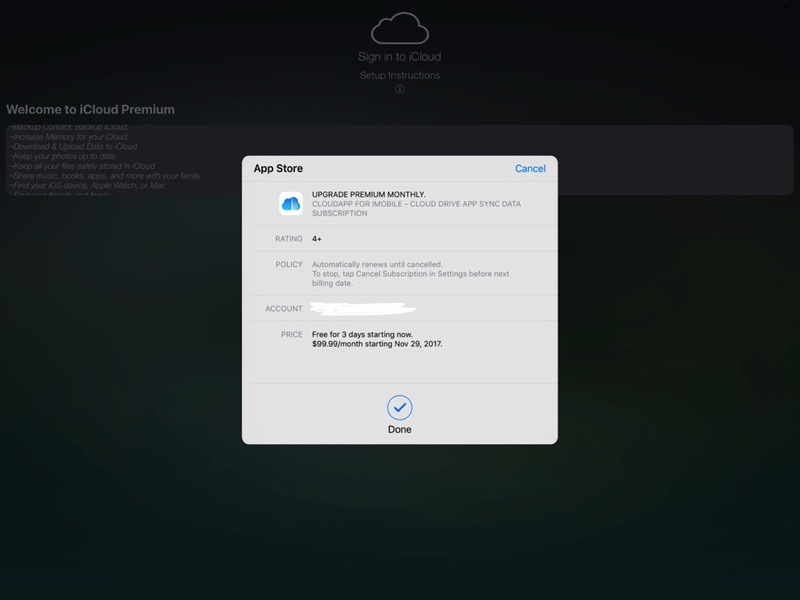 4.2.5 Apps that are primarily iCloud and iCloud Drive file managers need to include additional app functionality to be approved. There’s not much to do in the app besides browsing your files. But maybe the hefty Premium fee scratches the “shopping itch” that we all have, freeing us to do more productive things with our time than wandering around the local Tiffany & Co.
5.2.1 Generally: Don’t use protected third party material such as trademarks, copyrighted works, or patented ideas in your app without permission, and don’t include misleading, false, or copycat representations, names, or metadata in your app bundle or developer name. Apps should be submitted by the person or legal entity that owns or has licensed the intellectual property and other relevant rights and is responsible for offering any services provided by the app. Pretty sure there’s something in here about purporting to sell iCloud services. I write this for two reasons: one, I was genuinely curious how many App Store Review Guidelines one can flagrantly violate while flying under the radar. Refund all in-app purchases ever made in CloudApp for iMobile to the unwitting customers who shelled out for this scam. Personally apologize to said customers. The bigger reason for writing this is that I am genuinely frustrated. I’ve been on the blunt end of App Review rejections a number of times. Sometimes the rejections were useful and helped us provide a more useful, refined experience; other times we ran afoul of a nitpicked interpretation of a single minor guideline (in one case, requiring us to simply remove a truthful, non-trademark-infringing phrase from an app description – a change that made it harder for users to understand the service we provided). A better App Store ecosystem is good for everyone. Here’s a good place to start: reconfigure the app review process to let good apps through, and protect users from the bad ones. Right now it seems like the opposite is happening. p.s. If you have any good suggestions for a Droplr/CloudApp-like service for iOS, I’m all ears. In the meantime I may just Workflow it with Dropbox. ¬Increase Memory for your Cloud. The thing about using people’s real names to alert them, Pete, is that sometimes it can come across as an unnatural attempt to build rapport. Pete, have you ever read ​How to Win Friends and Influence People​? You’re probably not missing out. It’s a blight on society. You see, Pete, the author, Dale Carnegie, thought people love nothing more than hearing the sound of their own names. Which – I’m sure you’ve noticed, Pete – spawned generations of douchey salesmen who will incessantly throw your name into a sentence as though they have the right to it. They’ll probably even feign familiarity with your spouse and kids and infer that you should hang out sometime and maybe share holiday cards, Pete, even though they just laid eyes on you forty five seconds ago. I’m sure you’ve met people like this, Pete. You met them and you shook their hand and you accepted their greasy business card and then you left it on the bar when you refreshed your G&T because this is a networking event, Pete, but you’re not going to be anyone’s patsy. TL;DR: If you need someone to get notified in Slack, don’t try to work their name into the sentence. Just use their @username, for decency’s sake. Mindset: The New Psychology of Success (Carol Dweck) – Dweck’s TED Talks are great but the unabridged book well worth it. Read it if you care about living well. Born to Run: A Hidden Tribe, Superathletes, and the Greatest Race the World Has Never Seen (Christopher McDougall) – this book changed my perspective on human physiology and convinced me that running in 100° Phnom Penh heat is actually pretty tame on the scale of human athletic achievements (and, believe it or not, can be quite enjoyable). Wake, Sleeper (Bryan Parys) – a masterfully crafted memoir of growing up and grappling with faith. Equal parts tragic, hilarious, absurd, and profound, it was enjoyable and thought provoking to the end. This is one I read slowly, with my eyes, to savor the prose. High Output Management (Andy Grove) – with such a yawn-inducing title I almost passed it over, but I’m glad I didn’t. It’s one of the highest-density books I’ve read in terms of value-per-page. I’m sure I will return to it year after year. Influence: The Psychology of Persuasion (Robert B. Cialdini) – I’ll just copy from the book’s description: this is “the classic book on persuasion, [which] explains the psychology of why people say ‘yes’—and how to apply these understandings”. I had many ah-ha! moments learning to recognize why I behave in certain ways, often against my felt wishes. Finding George Orwell in Burma (Emma Larkin) – I’ve never paired travel writing with actual travel before but this provided an insightful introduction to Burma. Without it I could never have understood what a positive change has happened in the country in just ten years since it was published. New tasks will appear as private tasks at the top of your “My Tasks” list. If you’re an Alfred user, Mannie Schumpert’s QuickTask workflow is probably better. OmniFocus provides my daily roadmap for where I’m going. But maps can be unreliable: sometimes an emergency requires a detour … and sometimes you just pause for an unscheduled cup of coffee or phone call with a friend. Now a completed task appears in the appropriate location, and my Completed Tasks perspective gives a more accurate representation of the day. To use it, download the script and customize the project name and context to fit your needs. Should work with Alfred as well. You’ve done it a million times: You added a task in Quick Entry. Then, seconds later, you came across a link that would have been useful to include. Or an idea that should be part of that task. Quickentry a new task with more details. You’ll have to merge the two later, but hey. Fire up LaunchBar, hit a-n-space to access the Append Note to Newest Task script, and type your note. Tap Enter and rejoice: your note is added to that task you just created, and you haven’t lost your flow. If you want to add links or other notes instead – or you (gasp!) don’t use LaunchBar or Alfred – just execute the script without custom input and it will append your clipboard contents instead. p.p.s. 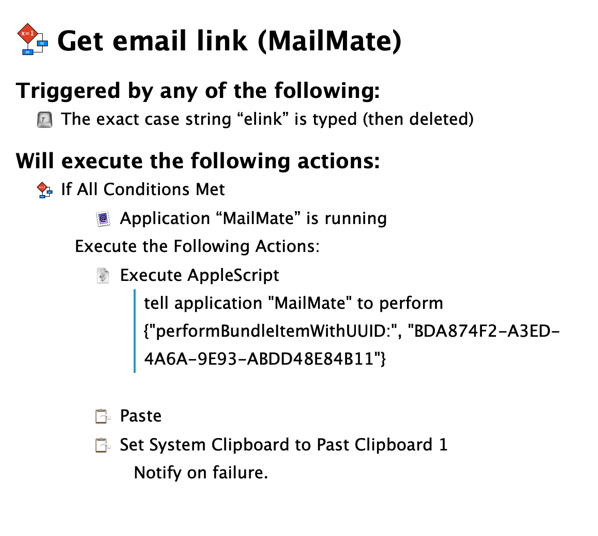 Updated 2015-05-17 to work around a bug that overwrites a file attachment when editing a task note. 2017-04-17 update: Now includes an option to focus in new tab. Thanks Marek and Kraig for the request. 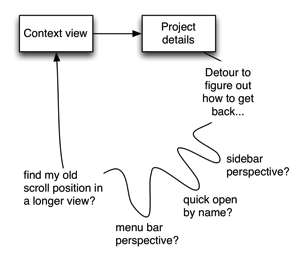 TL;DR: This script opens the project of the selected task(s) in a new window (or tab). It’s been a while since I last posted… so what better way to break the silence than with some new OmniFocus scripts? I don’t think it’s controversial to say that context-based perspectives are the secret sauce of OmniFocus. Without context views, OmniFocus would be a simple outliner with quick entry and a few filters. But context perspectives let you view the exact cross-section of tasks you need to be effective. That is, until you view a task in a context-based perspective and realize you need to see the whole project. It should be simple to view a project’s details without losing your place in the current context view. And it was simple in OmniFocus 1: while in a context view, double-clicking a task would open its project in a new window. Quick Open (⌘O): allows you to type the name of a project and open it in a new window (if that option is selected). But this requires typing and the cognitive overhead of thinking about the name of the task’s project. It’s worth mentioning that Kourosh Dini presents some very useful and related workflows in his excellent Creating Flow with OmniFocus, but in my view none of these methods has the simplicity of a quick – and mindless – round-trip to the task’s project view. I’ve been using this countless times per day and thought it high time to share it with the world. Focus in New Window/Tab on Github. p.s. This script includes a custom icon to look better on your OmniFocus toolbar, so I’m linking to a zip file that includes this and other scripts; let me know if this is an inconvenient way to download it. p.p.s. I’ve also updated some of the older scripts, notably Snooze and Shift (formerly called Defer). If you use them – especially if you also use LaunchBar or Alfred – you may want to take a look. p.p.p.s. Because OmniFocus doesn’t currently (as of 2017-04-17) have native AppleScript support for managing tabs, Focus in New Tab has a few dependencies. Please check the inline notes if you run into any hiccups.